We invite conversation around data sources, methods, and substantive research themes. For questions about code, please see the rules listed below. You will need a free GitHub account to post a question on the discussion board. Once you have posted a question or a comment you are subscribed to the conversation automatically. You can subscribe to a topic by selecting the “Notification” feature, or similarly unsubscribe. There is some skill involved in asking coding questions so that they are clear, and providing a simple example that demonstrate your particular problem. This will improve the responses that you receive. 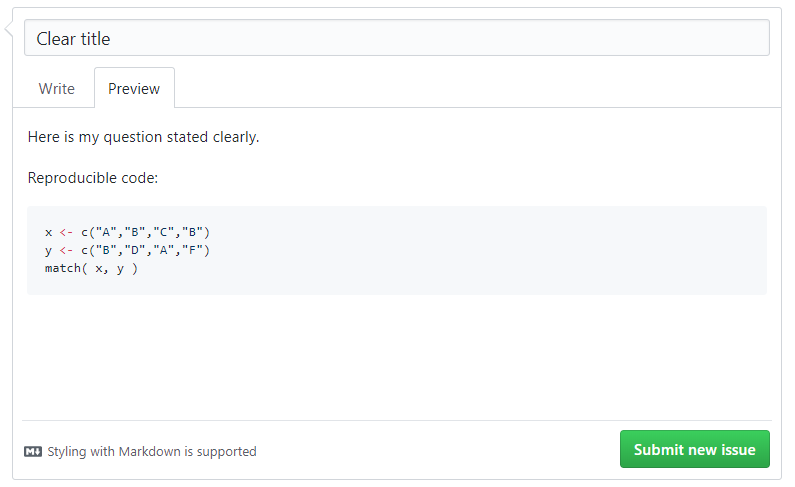 For a more in-depth overview, see the blog devoted to asking clear questions on StackOverflow. Check the existing list of questions and topics to make sure your questions has not been asked already. Often times the answer already exists, you just need to read a couple of previous discussions. Often times people will post code without explaining what they are trying to do. Be clear about your goal so that the problem is easier to spot. I am trying to merge my data, but I keep getting the error message, “x is not a factor”. You need to show the code that generated the error message. 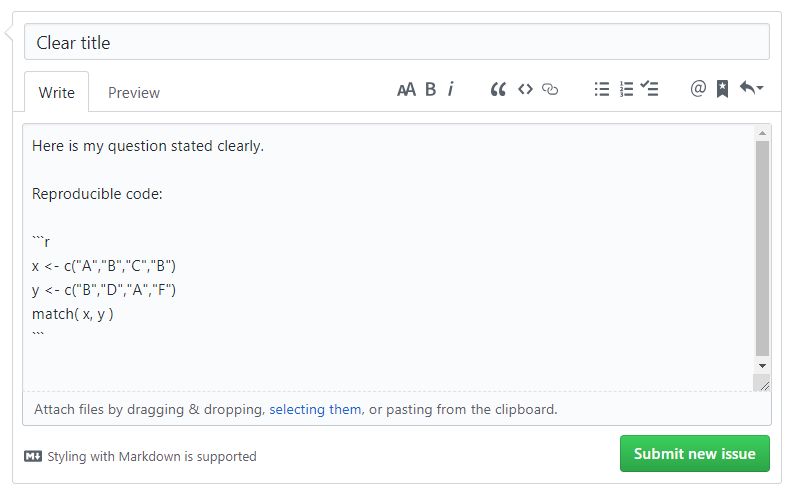 GitHub speaks Markdown, which allows you to write questions that include reproducible code so that others can easily diagnose the problem and offer you solutions. Computer code for the most part ignores spaces, you don’t have punctuation, and you can nest functions, style describes how readable and clear your code is. You can write accurate and functional code that is really hard to interpret. With good style it will be easier to share and maintain. It means, “Association for Subordinate Officials of the Head Office Management of the Danube Steamboat Electrical Services”. Although technically allowable, these compound German words are impossible to read and pronounce. Similarly, your code technically might be correct, but it is much easier to read if you treat each argument as a separate word and use spaces accordingly. Which is easier to understand? You can include data in your questions in a few ways. There are some functions that allow you generate random data that can be used to demonstrate the problem. Many packages include built-in datasets that can be easily loaded with the data() function. If the data is important for your question, you can post a small sample of your data using the dput() function. For example, here is the dput() output from the US Arrests dataset that comes with R.
Thus dput() makes it easy for people on the discussion board to re-create your original dataset.